Beautiful country house with 6 bedrooms and 3 bathrooms, with solar heated pool, and stunning 360 degree views of the mountain, located in a quiet rural area just 5 minutes from the local bar and about 10 minutes by car from the traditional Oria village, which offers all the comforts. This charming property is currently a 4/5 bedroom family home with a guest annex of a bedroom, lounge / kitchen and bathroom, which has its own private access along with access from the main house. There is also the possibility of further dividing the main house to create an additional guest apartment with a bedroom, living room and bathroom, leaving 3 bedrooms in the main house, or the whole property can equally be used as a spacious family home of 5 / 6 bedrooms. At the front of the property is the paved driveway and there is a separate area for additional parking that includes a car-port for two cars. The entrance door opens into an entrance hall with two wooden doors leading to a double room on each side of the hallway. A traditional arch leads to a spacious kitchen with fabulous colored tiles. At one end of the kitchen there is a door leading to the dining room and, on the other side, a few steps with a door lead to a living room with a wood stove and a gas stove. An open entrance with steps leads to a living room with electric fireplace and ceiling fan. The living room also gives access to a service room that could easily be converted into a bathroom. From the dining room, an open door leads to a corridor with stairs leading to the first floor and a useful storage area below the stairs. From here, a door leads to the part of the house that could become the second guest apartment. Currently consists of a living room with a door leading to the front garden, a double bedroom with ceiling fan and a large bathroom with full size bath and shower. The stairs lead to a spacious living room with a wood burning stove and wooden beams, and a door leading to a study / office or possible sixth bedroom. Another door to the living room leads to a large bathroom with full size bath and tile shower, from here, an arch leads to a dressing room with a door leading to the master bedroom. 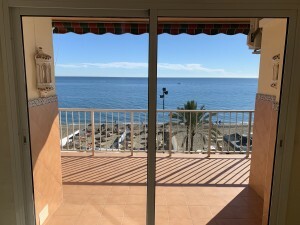 This spacious room has air conditioning and a ceiling fan, and has doors that open onto a private terrace to enjoy the sun and the fantastic views of the surroundings. The living room on the first floor gives access to the separate guest apartment, with a large living room, open with a small kitchen at one end, a bright and sunny double bedroom, and a bathroom with shower. A door from the kitchen gives access to a beautiful terrace with spectacular views towards the pool and the mountain, from there there is an external staircase leading to the pool area. The 10x5m heated pool is in a beautiful garden with patio areas with tiles that offer rest areas with shade and sun. The pool is surrounded by a variety of palm trees and other flowering plants and shrubs, along with a small house with beautiful Andalusian tiles and a shaded terrace with pergola. The garden also has fabulous handmade mosaic artwork and external lights with remote control. The rest of the land is planted with olive and almond trees, and there are some areas, which are suitable for the care of horses. The property benefits from gasoil central heating, along with double glazing and mosquito nets. There is also a 1000 liter water tank tank with pump. Amenities in the city of Oria include tapas bars and restaurants, supermarkets, a bakery, a butcher, banks, a 24-hour medical center and a pharmacy. There is also a small market every Sunday morning. 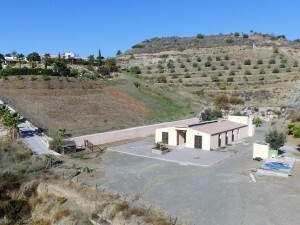 Oria is less than an hour from the coast, and about 1 hour and 20 minutes from Almeria airport. 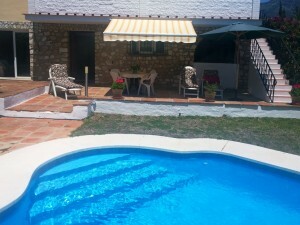 For more information and to organize a visit to this charming property contact us now!